1. 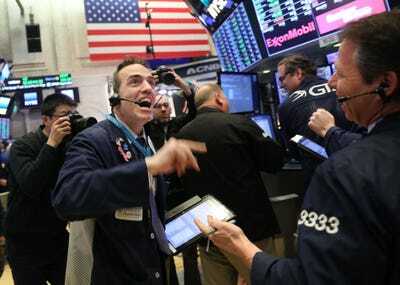 US Stocks rose again overnight, with the Dow Jones industrial average cracking 25,000 for the first time since late May. US Treasury yields also climbed, with benchmark 10-year yields holding at just below 3% this morning. 2. The European Central Bank is considering reining in its stimulus program. The euro climbed to a two-week high against the greenback and Eurozone bond yields rose after officials said quantitative easing could wind down by the end of the year. 3. The ECB developments saw Italian bond yields spike sharply for the second straight day, as the yield on Italy’s two-year debt jumped by as much as 36 basis points to 1.36%. Shares in Italian bank stocks fell early before rebounding, as the MIB index in Milan clawed back into positive territory by the close. 4. US crude inventories increased more than expected last week. The EIA reported an increase of 2.1 million barrels in the week ending June 1, compared with forecasts for a 2 million barrel drawdown. So US WTI crude fell while benchmark brent crude prices edged higher. Iron ore and gold prices were flat while copper continued its recent rally. 5. Productivity in the US grew at a slower pace in the first quarter than initially thought. While the US trade deficit hit a seven-month low in April. Record-high exports and a slight fall in imports shrunk the gap by 2.1%, the Commerce Department said, to $US46.2 billion. 6. Tesla CEO Elon Musk said at an annual shareholder meeting that the company will likely meet its Model 3 production goal this month. Shares rose more than 10% on the comment, but Wall Street is remaining cautiously optimistic. Australia’s international trade balance for April. President Donald Trump travels to Quebec to meet with G-7 leaders. The UK reports housing price data. The Bank of Canada’s Financial System Review is out. Twitter makes its debut on the S&P 500.